It is a common knowledge that sleep is a very essential part of the well-being of humans and animals but have you ever wondered why it seems your cat loves to lounge around and can fall asleep literally anywhere? Or better yet, why do cats sleep so much? Cats are active most often at the dusk hours towards the end of the day and will usually remain active until the break of dawn. This means that they spend most of the daylight hours snoozing. They sleep 16 hours a day on the average and some can even sleep for up to 20 hours in a 24-hour period! Even though cats love to hang out at night, they are also sociable and adaptable creatures so they can adjust their sleep pattern any time they want to. Some possible reasons for doing this could be to more properly coincide with feeding schedules or also to have more time to interact with humans during the day. So how can an animal spend nearly two-thirds of its life sleeping? The answer lies in the past. Cats share common ancestry with other big felines of the wild including lions, tigers, and cougars. These wild animals act the same way – they hunt their prey by stalking, creeping, and eventually expending huge bursts of energy to chase them down. Hunting in this way is mandatory for felines because they consume fresh meat and do not scavenge for leftovers. It also takes up a lot of energy for them to hunt which is why they spend a considerable amount of time resting and conserving their energy. Although cats have already been domesticated long ago, they still retain their predatory instincts. This is the primary reason why they sleep so much. Their brains are hardwired to conserve energy to be used- later when hunting or in our case, chasing a ball of string around. Another factor in the extreme lengths of “sleep” that they indulge in throughout the day is that perhaps they aren’t really asleep! Well, not the type of sleep that we’re familiar with. 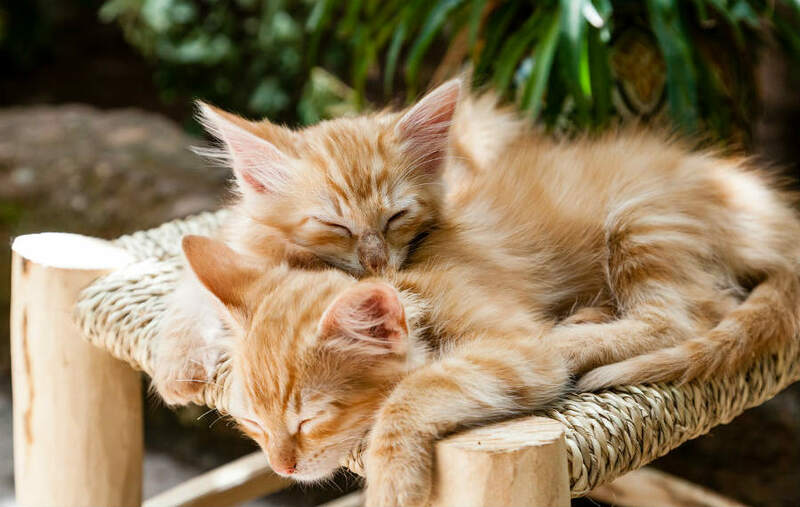 When cats sleep, they actually transition back and forth from deep sleep to light dozing. Deep sleep for them only lasts about 5 minutes, while dozing can last up to a half hour. While in light dozing mode, they position their bodies in such a way as to be able to very quickly jump up at a moment’s notice if the need arises. This is where the term “cat nap”, which means a short nap, originated from. “Sleeping with one eye open” is another idiom that may have started after someone observed the peculiar way cats sometimes sleep with their eyelids half open. Ever been at home on a rainy day and had the urge to snooze? You’re not alone. It turns out that your furry pet has the exact same urges. It’s known that felines are affected by weather in much the same way as humans and cats tend to be sleepier and consequently, sleep more during rainy days or in cold regions. It is not currently known exactly why cats enjoy sleeping so much when it rains. One possibility is that it could be another instinct programmed into them from their big cat ancestors which would have laid low and conserved energy during rainy days when it was more difficult to give chase. Diet could be another reason for their long periods of sleep. Being purely carnivorous, cats eat a lot of protein which requires long periods of sleep to digest. Eating such copious amounts of meat, no vegetables, and hardly any carbohydrates has surely contributed to the evolution of the cat as a sleeping machine. 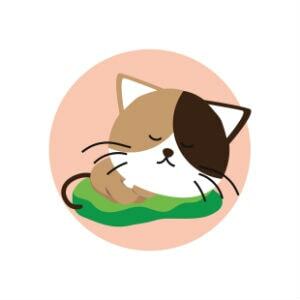 The science behind it all has hardly been definitively established, but the possibility of it being a factor that affects a cat’s sleep patterns is certainly present. Cats may have developed a false sense of security which gives them the idea that they can sleep for long periods of time. With larger members of their family being land predators on top of the food chain, the cat may have inherited some of those traits. The King of the Jungle and his pride would hardly be so alert as to expect that a larger animal would be hunting them. Although they’re now domestic and much smaller than their other family members, the feeling of being safe enough to sleep without being attacked may have been firmly ingrained into the cat’s brain. Unknown to most people, cats actually dream when they sleep. If you see their whiskers twitching or legs moving slightly, they’re most likely dreaming. For many years, it was unclear whether animals dream – until scientists conducted tests on rats and found that their brains had similar patterns of activity during sleep as ours do. It was only many years later that they discovered that most mammals, including cats, experience REM (Rapid Eye Movement) sleep. Kittens usually begin to dream when they’re 1 week old. Older cats tend to sleep more than younger ones. As a cat reaches seniority, it is normal for them to slow down and become less active. However, there could be other underlying causes for the increased sleep such as hyperthyroidism and arthritis. Therefore it’s best to have your cat checked by a vet if you observe strange behavior. Some cats snore when they sleep. Snoring occurs when passages in the nose and at the back of the mouth vibrate during breathing. The breeds which are the most susceptible to snoring are the Persian and other brachycephalic (short-nosed) cats. Snoring isn’t harmful but it could be an indication of underlying health issues. Some of the most common that need to be on the lookout for are obesity, respiratory infections, and viral infections.